three quick and easy breakfast ideas for seniors with diabetes. Crack an egg in a bowl, whisk it with a fork and toss in some diced veggies of your clients' choice, such as green peppers, tomatoes or olives. Stick it in the microwave for a minute or until it's fully cooked, then wrap it in a whole-wheat tortilla with salsa and some low-fat shredded cheese. 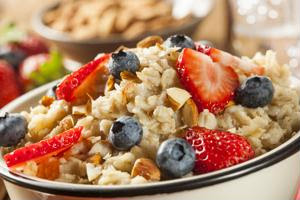 A cup of plain oatmeal is a good source of whole grains, and some fresh or frozen fruit mixed in adds delicious sweetness. If you're using frozen fruit, make sure there's no sugar added! Put a bran muffin in a bowl, and top it with a spoonful of low-fat yogurt. Add some fresh blueberries and strawberries for a quick and easy meal!